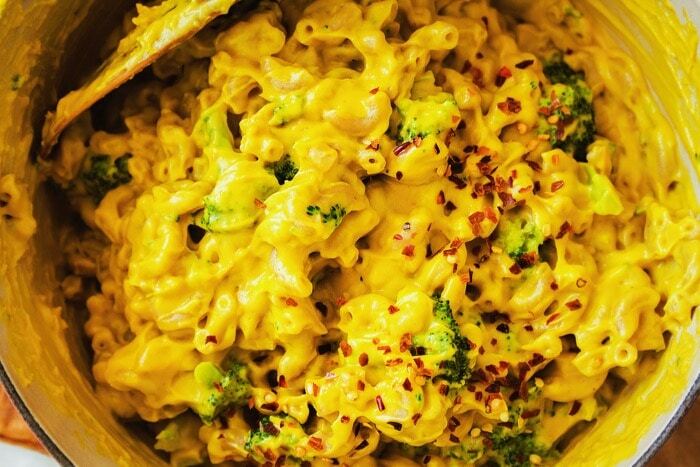 The best, easy vegan mac and cheese recipe with broccoli, roasted sweet potato and cashews. So simple a kid could do it! 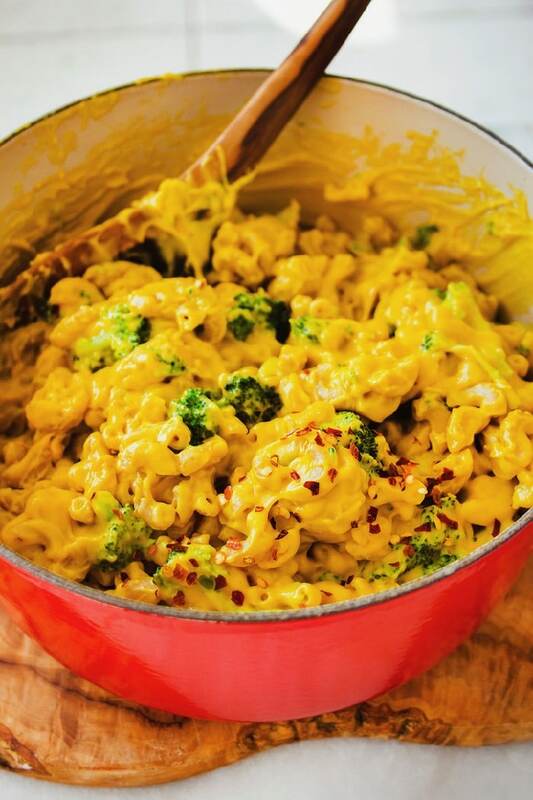 Vegan mac and cheese tastes amazing! Not only that but is is also a nutritious meal you feel good about feeding your family, plus it only requires a few ingredients. 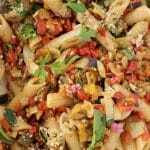 You have whole grains, supernatural broccoli, roasted sweet potatoes, cashews, nutritional yeast and a few spices. Add a tomato salad on the side and dinner is served! Sweet potato and butternut squash (even carrots & pumpkin) are totally interchangeable in this recipe so feel free to swap one for the other if you like. I’ll usually roast a big batch of them to have for the week, so really whatever is in the fridge is going in here. You can’t get this out of a cardboard box friends! Simple stove top and blender dinner: you cook the pasta and broccoli in the same pot and whip up the cheese sauce in a powerful blender. A few minutes of simmering is all the sauce needs to become lusciously thick and creamy thanks to the magic of tapioca. The Best! It’s so delicious, I’m making it for Thanksgiving you guys! 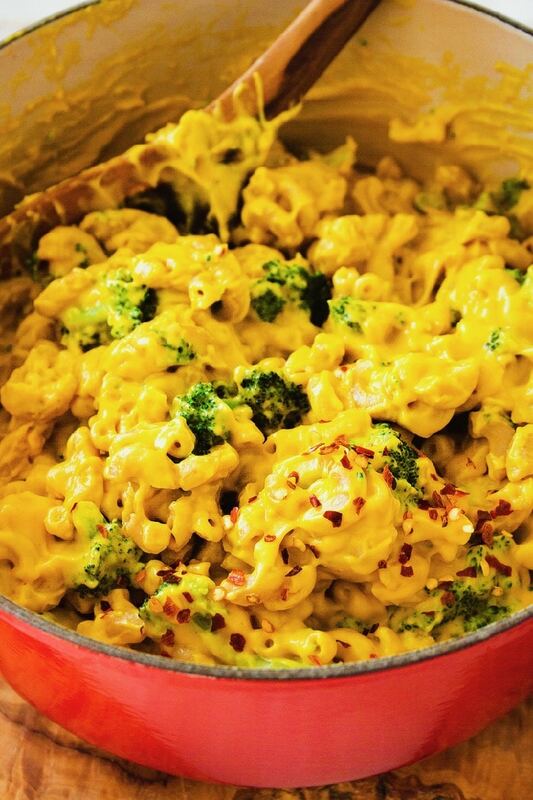 FAQ: Can you freeze vegan mac and cheese ? A: Not recommended, best served right away but it makes good leftovers. 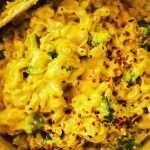 The best, easy vegan mac and cheese recipe with broccoli, roasted sweet potato, nutritional yeast and cashews. Rinse and soak the cashews in hot water for 3 hours or in cold water overnight. Drain and rinse again then add them to a powerful blender together with the roasted potato, nutritional yeast, all the spice and water. Process until silky smooth. Transfer the cheese sauce to a medium pot and bring to a simmer. Stir well for a few minutes until thick and creamy. Remove from flame, taste and adjust seasonings with sea salt and black pepper to taste. Meanwhile bring a large pot of water to a boil and add a good pinch of salt (the water should taste like the ocean). Add the macaroni and cook for 2 minutes less than the instructions on the box say. Add the broccoli florets to the pot with the pasta and simmer together for 2 minutes. 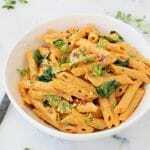 The pasta and broccoli should be perfectly cooked al dente at this point but give it a taste anyways. You don’t want overcook them. 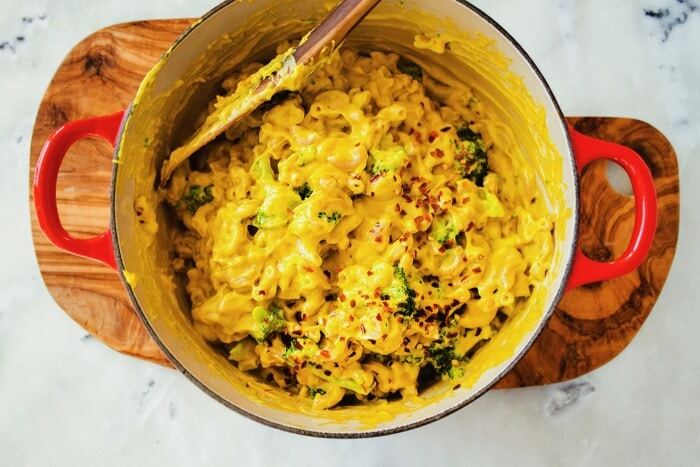 Drain the pasta and broccoli in a colander then add them to the pot with the cheese sauce. Toss everything to coat well in the cheese sauce and serve hot. Hi. I really want to make this but I simply cannot afford to buy nuts as it is too expensive here. Anything else I can substitute for the nuts? Try replacing the nuts with cooked white beans instead, I think that would work nice. 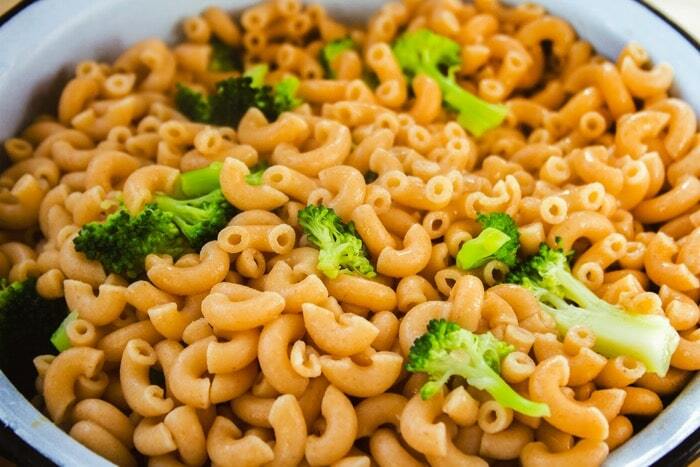 This Mac and cheese was incredible, the picky eaters approve and I got them to eat all their broccoli too. 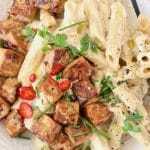 Can’t wait to try more of your recipes Florentina, thank you for sharing this. Yes, it is flour from cassava root.